American Banker recently published their annual Top 50 Banks to Work For compendium. I am proud to say that a few of the winners are clients. Why the pride? My firm does not specialize in happiness. We specialize in strategy and profitability. So why would I care if clients were lauded for bringing job satisfaction to their employees? It's all about perspective. During strategy sessions I am sometimes dismayed at some banks that make shareholder returns the fulcrum of their strategy. Shouldn't the very existence of our bank be nobler? We are all working our way through life. And most of us want our neighbors, coworkers, family and friends that navigate life beside us to do so with peace and happiness. We have far more customers than shareholders. And how we run our bank has a much more direct impact on employees' lives than shareholders' lives. On this Labor Day, I put to you that a strategy focused on customers and employees satisfaction is a better undertaking than solely focusing on shareholders. Shareholder returns is the scorecard that shows us how we are doing in serving customers and employees, and whether we deserve to remain independent to execute our strategy. I often invoke the term "right to remain independent". Put simply, a bank should deliver financial performance and total return equal to or better than would-be acquirers, so it is presumably better for shareholders to hold your bank's stock. The banks in American Banker's list ranged in asset size from $220 million to $19 billion and the number of full-time equivalent employees ranged from 51 to over 2,200. To say the least, the banks were wide and varied in size, charter, strategy, and geography. So comparing them to an index peer group is difficult. But I did it anyway. 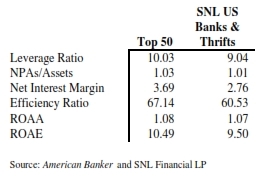 Below are some financial condition and performance metrics of the Top 50 compared to SNL's Bank & Thrift index banks. It appears that a focus on employee satisfaction has not adversely impacted financial performance. In fact, we have found that there is generally a positive correlation between bank size and financial performance, and the SNL Bank & Thrift index banks are undoubtedly bigger than the average sized bank in the Top 50, which was $2.2 billion in assets. The SNL Index includes all major exchange (NYSE, NYSE MKT, NASDAQ) banks and thrifts. No limited trading markets or private companies, where smaller banks tend to be. So the relatively smaller Top 50 delivered very similar financial performance than the larger index banks. 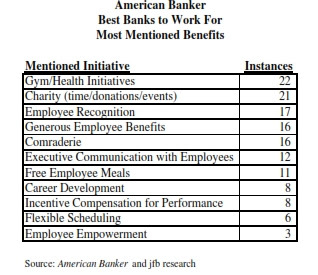 The American Banker list highlighted what was perceived as the major benefits of working for the Top 50. I carefully sifted through their list to identify common themes that were valued by employees. The results of my analysis are below. I was not surprised by some, such as free employee meals. Feed someone to make them happy. Makes sense. It did surprise me that gym and/or health initiatives topped the list. Perhaps, with continued digitization of bank processes and transactions, banks need less real estate than they have and it makes sense to put that space to good use for a healthy lifestyle employee perk. Some of the most mentioned benefits cost little to nothing, such as executives communicating with employees and vice versa, and flexible scheduling. Others do cost money, such as generous benefits, incentive compensation, and career development. But these hard costs did not result in lower financial performance, according to the first table. Perhaps one can conclude that a great place to work attracts more capable employees that can more effectively and efficiently serve customers even though the cost structure of the bank may be higher. 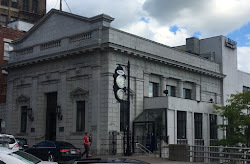 Would you rather build a bank with a slightly higher cost structure and very satisfied employees that delivers a similar return to banks with leaner cost structures and a greater proportion of curmudgeons?